Please Pay Your Entry Fee Here! Super Chess Clinic with IM Andrew Martin! We are dedicated to developing and improving chess players in Boise, Idaho, by providing an opportunity for national and international competition. We honor The Code: ‘When two tournament players face off, it is a battle to the death.’ We don’t have Grandmasters therefore we accept no Grandmaster draws. If you want a friendly game of chess, we suggest your local chess club. Our Idaho affiliates can be found on the Idaho Chess Association website. Private and group lessons are available with an hourly rate based upon your current playing strength. Lessons may be limited by instructor availability. Beginners are also welcome. The first two one-hour lessons are free. You are invited to check out our link to upcoming Idaho Chess Association events too. Take your pick of tournaments and organizers then enjoy a great chess tournament! We offer two USCF-rated tournaments each month. All of our tournaments are rated by the United States Chess Federation. Qualifying tournaments featuring four or more FIDE-rated players are rated with the World Chess Federation. Current and Future Tournament tabs at the top of our home page will inform you of upcoming events. While all active USCF members are welcome to compete in USCF-sections, the World Chess Federation proportionally limits participation of non-FIDE players. USCF players are placed in the FIDE section based upon registration date and time. Players not seeded into the FIDE section may have an opportunity to participate should a selected player be unable to attend. Our FIDE tournaments are designed to allow a USCF player to earn a FIDE rating. FIDE-ratings are earned by playing four FIDE-rated opponents and drawing one game. There is no minimum FIDE-rating requirement to compete in the FIDE sections. We’ll pair any FIDE-rated player from 0001-2894…except for computers, naturally. Time controls for FIDE events are g/90+30i. The minimum guaranteed prizes in a qualified FIDE section are $50 First, $30 Second and $20 Third. All FIDE-Titled competitors play for free. The Chandra Alexis Chess Club is Honored that you have selected our event. We never deduct an entry fee from your prize. Never! Are you tired of playing in the green glass section? Do you have a death wish? Excellent! We have some scholastic players that will eat your lunch! 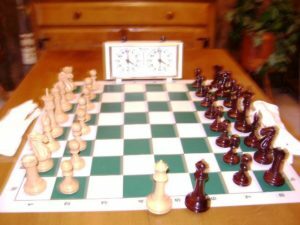 You have a standing invitation to bring a board, clock, chess set, your rating points and your lunch to our tournaments. We are happy to provide opponents, score sheets and a thoughtful letter to your next of kin. Welcome to the Chandra Alexis Chess Club! Our goal is to offer FIDE-rated Open Swiss Tournaments in Boise, Idaho in 2019. Our mission is to provide you with the best nationally and internationally rated tournaments in the western United States. This is your opportunity to have fun, learn, and improve!